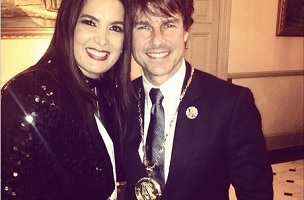 Meanwhile, Tom Cruise was in London this month and per an Instagram photo showing him standing alongside former Miss Venezuela World Ruddy Rodriguez, he could be seen wearing his Scientology Freedom Medal of Valor. This should put to rest all of the rumors promoted by the tabloid press that Tom was getting away from Scientology — rumors we never took seriously. But we have to ask, where is the tabloid press? The outlets that remark on Cruise’s every move are surprisingly silent on this, and now the photograph has been up (and it’s still there) for more than three days. What are they waiting for? Make that, now, more than 12 days. At press time, the photo is somewhat surprisingly still posted on talent manager Luis Bascaran‘s Instagram account.